Kaoru Chiba was a leader of horn players and other musicians in Japan, a teacher to a generation of horn players, and revered for his beautiful singing style on the horn. He was affectionately known as "Bachi" by everyone and was famous for his warmth and humor, as a chef, and for his hospitality, inviting touring horn sections to parties at his home. Bachi was born in 1928 in Beppu, Ohita Prefecture and grew up in Tokyo. Both his parents were graduates of Ueno Conservatory of Music. Bachi started on violin at age seven, but he didn't like its high sound. Entering junior high school in 1940, he encountered an alto horn. Bachi failed his first entrance exam at the Tokyo Conservatory of Music – he told the story of being unable to write about a famous dramatic writer, Chikamatsu – but he passed the same exam a year later, in April 1945. Life changed in Japan after the end of World War II (August 1945), and Bachi took up guitar and jazz, earning money at the US Officer's Club in Tokyo. Dr. Daigoro Arima, Secretary-General of the Nippon Symphony Orchestra (now the NHK Symphony Orchestra) invited Bachi to become an apprentice of the orchestra while studying at the Tokyo Conservatory with Professor Nagata. Bachi became a regular member of the orchestra when he graduated from the conservatory. In the autumn of 1956, Bachi traveled to England and Germany to study. The first time he met Dennis Brain, at a recording session, Brain was very surprised to see him talking amiably with Karajan, who had been a guest conductor of the NHK orchestra two years before. Brain agreed to give Bachi lessons, but when Bachi returned from Germany, where he had studied with G. Neudecker and M. Strupp, he discovered in the newspaper that Brain had died in an automobile accident the night before. In 1966 von Karajan invited Bachi to the Berlin Philharmonic, but Bachi famously turned him down because, "In Berlin I can not find any fresh and delicious sushi." 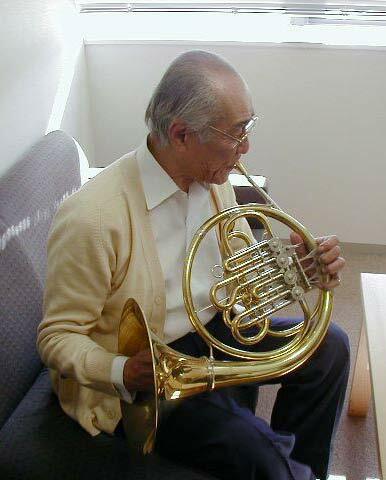 His colleague Chiyo Matsubara recalls that Bachi started playing on a single F horn with the bell on his leg. But after he returned from England and Germany, he played an Alexander single B-flat horn with the bell off the leg. Many conductors praised his playing. Bachi was principal horn of the NHK Symphony Orchestra for 36 years, until mandatory retirement age in 1983. In 1982, he received the first Arima Prize, given to a person who has made an outstanding contribution to the orchestra. After retiring, Bachi played in the New Japan Philharmonic (1983-1997). Bachi taught at the Kunitachi Academy of Music, the Tokyo National University of Fine Arts and Music (formerly the Tokyo Conservatory of Music), Toho School of Music, Yamagata University, Japan University, and Nagoya Music University. He was also President of the Tokyo Horn Club and a member of the board of directors for both the Japan Federation of Musicians and Affinis Arts Foundation. In 1993 he received a Special Prize in Music given by the Nippon Steel Company. He also served as artistic advisor to Yamaha. Bachi was a member of the IHS Advisory Council from 1986-89 and elected an Honorary Member in 1989. He was one of the hosts for the 1995 IHS Symposium in Yamagata.